"We don't know whether the amount of vote fraud was significant enough to change the outcome — or more than 1 percent — but definitely something happened." "We are trying to cleanse members of FETO (the Gulenist movement) inside the armed forces, inside the judiciary and inside the police." "These people are mainly those who attended the protests after the referendum and raised their voice against the referendum result on social media." "The police told the detainees that they were accused of trying to agitate people against the ‘yes’ vote." In democratic Turkey you use your voting right to vote for the government, the government way, none others acceptable. To do otherwise is to risk freedom. And now that the government of Recep Tayyip Erdogan has full presidential powers of a length and breadth never before seen in the country, where the Justice and Development Party's leader is now able to make uncontested legislation and the position of Prime Minister is no more, full autocracy has taken the reigns from partial democracy on its way to dictatorship. Two new decrees have been passed by the Turkish government. One to expel over four thousand civil servants, and the second, banning television dating programs. Connection? dubious; each, however, restraining in their own ways, political and social freedom. Turkey's Official Gazette published the decrees several days ago, with the first listing the names of thousands of civil servants who are to be dismissed. That number includes just about 500 academics and over 1,000 Turkish military personnel. The second decree bans radio and television programs whose purpose is described as "finding friends and spouses"; activities obviously determined to be un-Islamic in character. As well, a court order the same day blocked public access to that infamous den of iniquity, Wickipedia; Turks will no longer enjoy wicked access to the online encyclopedia warping their minds and leading to mass psychosis. The reason is simple enough; to protect "national security and public order". 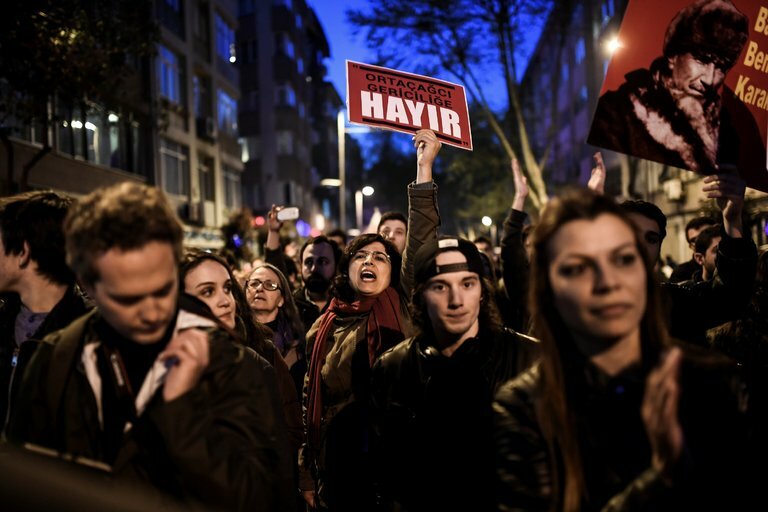 "The loss of availability is consistent with Internet filters used to censor content in the country", stated Turkey Blocks, an Internet censorship monitor. Turkey's official news agency, quoting the Ministry of Transport, Maritime Affairs and Communications, clarified the issue, citing the concern that the site was a leading agitator in a smear campaign against Turkey through concerted international malefactors' plan to slander the country and its leader. And on the war front, Turkey's airstrikes against Syrian Kurdish militia across the border doesn't sit too well with its NATO partner, the United States, since the targets of Turkey's warplanes just happened to be Washington's main ally combating Islamic State in Syria; in fact, the only reliable militias capable of winning battles against Islamic State and focusing on that end. For its part, Turkey's repeated demands to the U.S. to cease supporting the Syrian Kurdish militants remains a major Turkish irritant. In response to which, U.S. troops have been dispatched to patrol the border in Syria. Should Turkey inadvertently target American troops the response would most certainly be proportional to the gross stupidity involved. The presence of American armoured vehicles in Kurdish areas of Syria represent a useful buffer separating Kurd-hating Turkey and American-allied fighting Kurds. "Peace be with you [As-Salaam Alaikum in Arabic]. True faith leads us to protect the rights of others with the same zeal and enthusiasm with which we defend our own [in Italian]." "As religious leaders, we are called to unmask violence that masquerades as purported sanctity. Let us say once more a firm and clear 'No' to every form of violence, vengeance and hatred carried out in the name of religion or in the name of God." "To counter effectively the barbarity of those who foment hatred with violence, we need to accompany young people, helping them on the path to maturity and teaching them to respond to the incendiary logic of evil by patiently working for the growth of goodness." "[There must be an end to the] proliferation of arms [and] demagogic forms of populism." "If they [arms] are produced and sold, sooner or later they will be used. Only by bringing into the light of day the murky maneuverings that feed the cancer of war can its real causes be prevented. National leaders, institutions and the media are obliged to undertake this urgent and grave task." Pope Francis travelled to Egypt to deliver a message of peace. Years before he did so, newly-inaugurated President Barack Obama also travelled to Egypt to address what he was anxious to inform the universal Islamic community of, a change in relations between the West, led by the United States, and Islam. Since that time, violent, fanatic Islam has grown in influence among the faithful, an extremely small proportion of the umma, the worldwide faithful to be sure, but still representing hundreds of thousands devoted to the message of violent jihad. The influence among Muslims worldwide of the message of violent jihad, although not taken up by all that it impresses, has considerable support of millions of Muslims, many of whom live in the West. Sectarian violence has proliferated with Sunni and Shia Muslims persecuting one another and committing atrocities against non-Muslims; Christians, Yazidis and others whom Islamofascists consider human dross they are obligated by Islamic calls to the faithful, to obliterate from the face of the Earth. 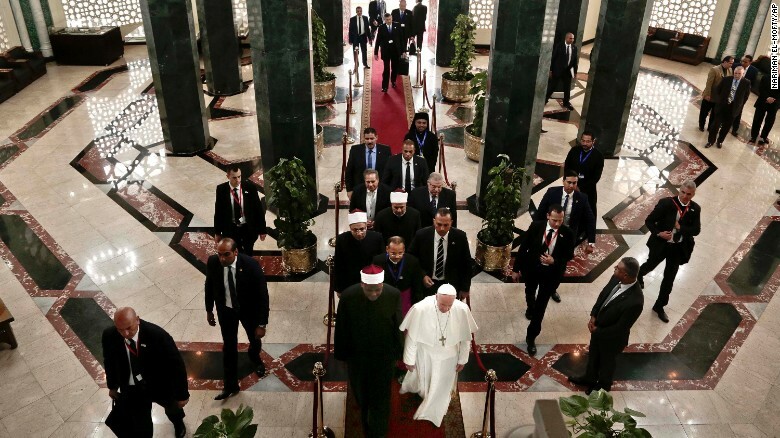 But it is the head of the Roman Catholic Church who has made a pilgrimage to the seat of academic power in Islam, to plead for friendship and a cessation of hostilities. Admittedly, launching a barrage of criticism and demands would elicit no co-operation from Islamic authorities. But the very Grand Imam of Al Azhar university, Sheikh Ahmed al-Tayeb, will not condemn Islamic State and its jihadi hordes, on the basis of the very fact that they are faithful to Islam. A year and a half ago, Egypt's President Abdel-Fattah El-Sissi made a formal statement widely disseminated, of his opinion that Islam must undergo a change in its formative precepts to reflect the modern world in which we all live. He railed against the basic pillars of Islam that decree no other religion has the status of Islam in god's eye, and that it is the steadfast obligation of every Muslim to evangelize and spread the faith, a faith that arose out of slaughter of non-Muslims and which continues to pursue that path. At the thousand-year-old, venerable institute of Sunni Islam learning, the two theocratic leaders of the world embraced and warmly assured one another that peace was what they both sought for their flocks. 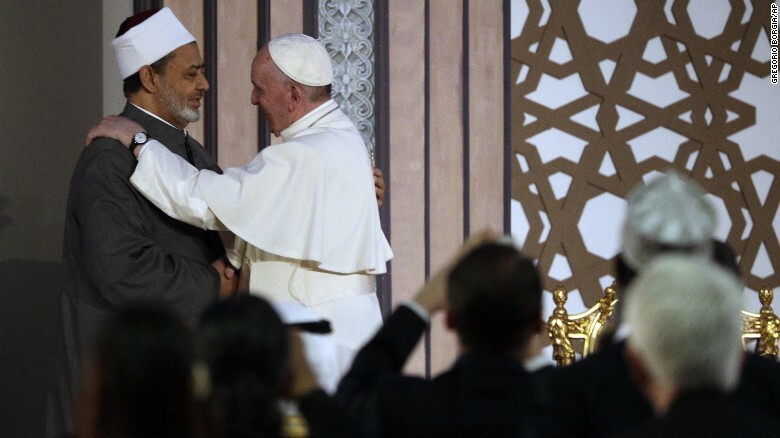 Speaking before a crowd at Al-Azhar, Pope Francis emphasized the value of knowledge and the search for an open-minded education to advance peace int he world, and to combat the "barbarity" of religious extremism. And even while Pope Francis's warmth toward Sheikh Ahmed al-Tayeb was touching, there are other issues. Chief among them that though President El-Sissi himself called upon the Grand Imam to finally initiate a formal process whereby Islam could be turned toward enlightenment, nothing has ever come of it. The media in Egypt that leans toward support of its current government, accuses the Al-Azhar leadership of disinterest in reforming the religious discourse of Islam, and to purge of its canonical scriptures the outdated teachings that propel Muslims to hate those outside of Islam. Preparing for ... War ... ? "We are not seeking regime change and our preference is to resolve this problem peacefully. But we are not leaving anything off the table." "[The United States is willing ] to test that hypothesis [that Pyongyang may be willing to surrender its weapons programs] to the maximum extent we can [to achieve a peaceful resolution the current impasse]." "It's only been a month or so and it's too early to tell. I wouldn't bet my farm on it [that talks between the U.S. and Chinese administrations may yet bear fruit in dissuading Kim Jong-Un from his current trajectory]." "In confronting the North Korean threat, it is critical that the U.S. be guided by a strong sense of resolve both publicly and privately in order to bring Kim Jong-Un to his senses, not his knees." "[The group of American war ships is in striking distance of North Korea] if the president were to call on it." The U.S. Senate Armed Services Committee is sitting and interviewing principals in the Trump administration to attempt to get a sense of just how urgent and compromising the current belligerence of North Korea against its neighbours is at the present time; whether there is a perceived or an actual need for intervention of some nature, or whether relying on continued diplomatic and economic sanctions may yet turn the tide. 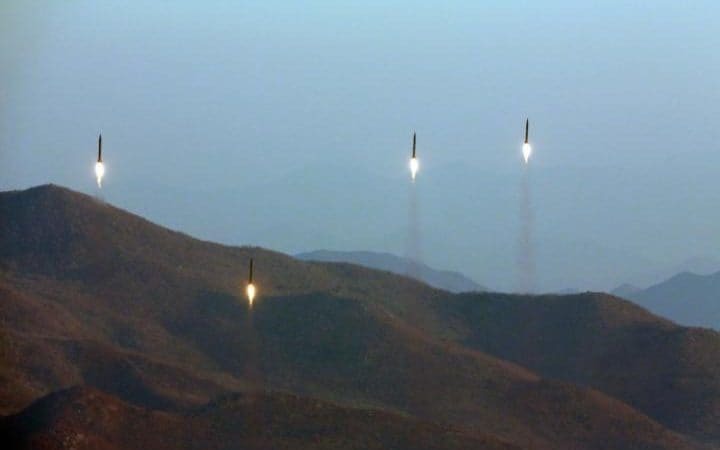 In lieu of participating in the process by appearing before the committee, it seems that the bad-boy president of the Peoples Republic of North Korea chose to test yet another ballistic missile today. Admiral Harris testified that in his opinion, no doubt exists that Kim Jong-Un remains intent on completing his personal mission of obtaining a nuclear-tipped missile able to strike the United States. And as long as the United States believes this to be the case, Kim will remain in American cross-hairs. At the same time, the U.S. is quite well aware of the constraints imposed upon its response to Kim's provocations through a preemptive strike, certain to elicit a suicidal response from a leadership determined to prevail, believing in its own invincibility. Admiral Harris cautioned the committee that though it is true that American intelligence remains uncertain over how advanced the North's nuclear and missile programs are, the fact is that wherever they are on their programs' technical advancement scale, they will eventually succeed; not if, in other words, whether they will eventually be in command of the weapons that will threaten the United States' coastline and America's Korean Peninsula allies, but when. It is the 'when' that is the most worrisome element, at the moment. Which is precisely why prevention is the key. And if prevention is the key, China is seen as the enabler of turning that key in its lock. Security Council resolutions and far tighter economic sanctions to coerce the North into an unwilling role of standing back from its weapons ambitions swerve around the fact that China represents its safeguard and support until such time as it can boast and threaten with weapons at its command. China urges caution, votes against Security Council resolutions, refuses to tighten sanctions, but its diplomatic gestures with the North fail. Altitude Area Defence) being installed in the South is apoplexy-inducing yet it is a response to the fears expressed by South Korea in the face of ongoing threats and violent actions by the North. A strike by the powerful United States would give the North the opportunity to strike back with all the considerable means at its disposal, from high-tech weaponry to its million-strong armed forces. East Asia U.S. diplomat Susan Thornton, in speaking before a Foundation for Defence of Democracies event, explained that the Trump administration views North Korea as its most vital threatening security challenge, leaving it seriously considering that "all options are on the table." North Korea's steadily advancing nuclear plans, alarm over Pyongyang's atomic and missile testing are all providing pressure on both the United States and China, in a proxy struggle for alignment and stability in response to a rogue outlier's threats. North Korea has not in the least bit wavered in its search for weapons of mass destruction, despite current financial sanctions on the North by the U.S. and other countries. As for the Kim regime being threatened by within, not a faint hope. It remains a "hollow hope", said Admiral Harris to even imagine that North Koreans could rise up to topple their revered "god king". He also said that though he has enough forces to "fight tonight" should that become imminent, he lacks the number of attack submarines required. 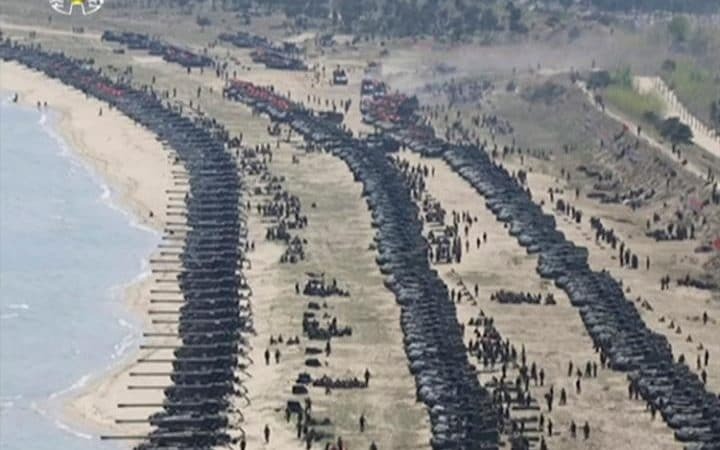 And nor has he capable defence adequate against the thousands of artillery pieces that North Korea has mounted close to the Demilitarized Zone which separates North and South Korea.